Although the terms lateral secondary and accessory canals are often used interchangeably they mean different things. The accessory canal is derived from the secondary canal branching off to the periodontal ligament in apical sections. Different methodology was used to study the accessory canals. Decalcification method appeared to the important in studying the accessory canals as compared to digital radiography and histological sectioning. 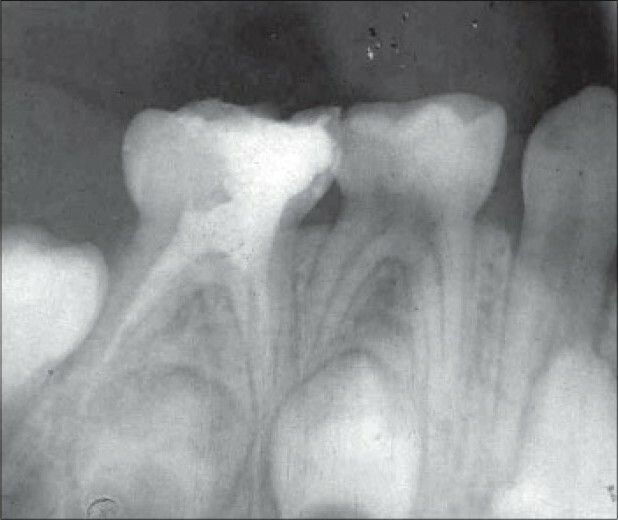 Endodontic treatment was performed on 25 pulpally involved mandibular primary molars in 4 to 9-year-old children; the root canals were obturated with a new root canal filling material consisting of a mixture of calcium hydroxide, zinc oxide, and 10% sodium fluoride solution, using hand-operated lentulo-spirals. All cases were evaluated clinically every 3 months and also radiographically every 6 months to assess the success of the treatment; we also examined the resorption of the root canal filling material from the root canals and the status of overpushed material, if any, as the tooth resorbed with the passage of time. At 6 months, endodontic treatment in 2 of the 25 teeth had failed and one tooth had exfoliated; the remaining 22 teeth were without any signs or symptoms. At the end of 2 years, 14 teeth could be evaluated; out of these 12 had physiologically exfoliated. It was observed that the rate of resorption of this new root canal obturating mixture was quite similar to the rate of physiologic root resorption in primary teeth. In three cases, where there was an overpush of the mixture, a gradual partial resorption was noted. This study was designed to examine the effect of fissure morphology on penetration and adaptation of fissure sealants and their relationship with the eruption time of tooth. Materials and Methods: One hundred and fifty extracted molars and premolars were divided into two groups on the basis of their eruption time. The two groups were further divided into five subgroups on the basis of fissure morphology. An scanning electron microscopic analysis of penetration and adaptation of sealant was done. Observations and Results: V- and U-shaped fissures were found to have the maximum penetration. Penetration was very poor for I- and IK-types of fissures. No significant difference in penetration was found in relation to eruption time. Adaptation of sealant was not affected by any of the factors. Conclusion: Even the well-applied sealant does not necessarily provide complete obturation of pits and fissures, thus necessitating periodical clinical observation to determine the success or potential failure of the sealant treatment. Background: Glucosyltransferases (GTF) play an important role in the adherence of bacteria to acquired pellicle. Cocoa bean husk extract (CBHE) has been shown to possess anti-glucosyltransferase and antibacterial activity. Aim: This study aimed to evaluate the effect of CBHE on plaque accumulation and mutans streptococcus count when used as a mouth rinse by children. Materials and Methods: Scaling of the teeth of the selected children was done and the children were instructed to refrain from their routine oral hygiene practices till the morning of the fourth day; they were instead given a placebo mouth rinse for use during this period. On the fourth day, saliva was collected from each subject for microbiological analysis and plaque was disclosed and scored using the modified Quigley and Hein plaque index; later, the teeth were cleaned. After 1 week, scaling of the subjects was done and they were given CBHE mouth rinse to rinse their mouth, following the above protocol. 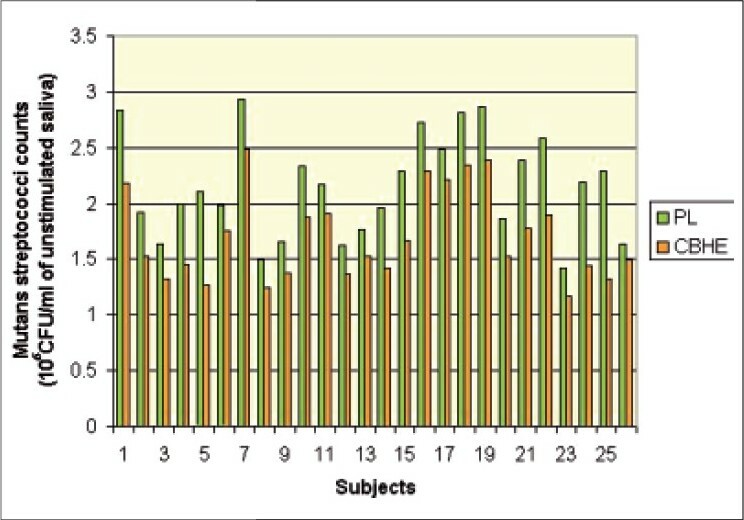 The data was statistically analyzed using Wilcoxon's signed rank test. Results: There was a 20.9% decrease in mutans streptococci counts and a 49.6% decrease in plaque scores in the CBHE group as compared to the placebo group, which was highly significant (P value < 0.001). Conclusion: CBHE is highly effective in reducing mutans streptococci counts and plaque deposition when used as a mouth rinse by children. Amalgam's non-adhesive characteristics necessitate cavity preparations incorporating retentive features, which often require the removal of non-carious tooth structure. Use of adhesives beneath amalgam restorations, would be helpful to overcome this disadvantage. 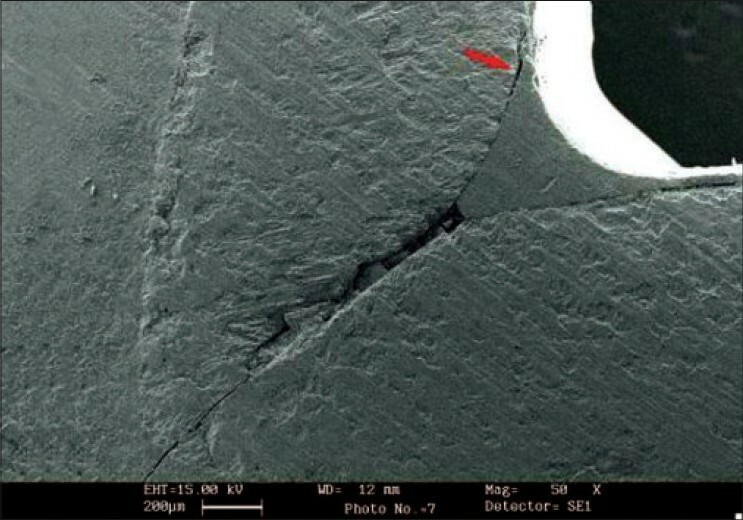 This study was undertaken to compare the mean shear bond strength of amalgam bonded to primary and permanent dentin, to evaluate the efficacy of amalgam adhesives in pediatric dentistry.27 primary and 28 permanent posterior teeth with intact buccal or lingual surfaces were grounded to expose dentin and wet-polished with 400-grit silicone carbide paper. Scotchbond Multi Purpose Plus adhesive system was applied to the dentin surfaces and light cured. Amalgam was condensed onto the treated dentin through a plastic mold.shear bond strength testing was done using an Instron Universal testing machine, at a crosshead speed of 0.5 mm/min.The data were analyzed by independent samples t-test The difference among the two groups was not statistically significant (p>0.05) Bonded amalgam showed the same level of bond strength to primary and permanent dentin; so, application of amalgam bonding agents in pediatric dentistry can be recommended. The most common dental disease in childhood is dental caries. This study was carried out to recognize the components of saliva which are protective factors in children to evaluate and predict caries susceptible and caries resistant individuals. Unstimulated whole saliva was obtained from 75 children aged 3-5 years. They divided into three groups: decayed missing and filled teeth (dmft) > 6 (severe caries), 1 < dmft < 6 (moderate caries), and dmft < 1 (caries free). Unstimulated whole saliva assayed by biochemical methods to determine salivary calcium, inorganic phosphate, and alkaline phosphatase. There was no significant changes in salivary calcium, alkaline to phosphate and alkaline phosphatase activity and their ratio with progress of caries ( P > 0.05 ). 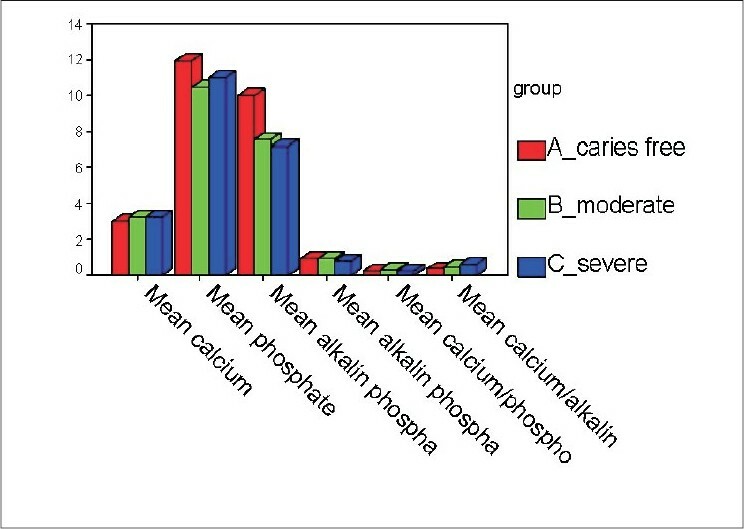 Although the results showed that salivary phosphate and alkaline phosphatase in caries free group and calcium in the group with severe caries were somewhat more than those in other groups. Despite of the results of the present study, the relationship between salivary components and caries rate in children remains controversial. 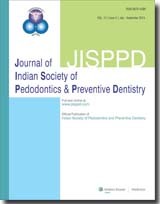 So more studies are necessary to achieve some practical criteria for predicting dental caries, recognition of susceptible persons, and finally prevention of caries in children. Papillon-Lefevre syndrome is a very rare syndrome of autosomal recessive inheritance characterized by palmar-plantar hyperkeratosis and early onset of a severe destructive periodontitis, leading to premature loss of both primary and permanent dentitions. Various etiopathogenic factors are associated with the syndrome but a recent report has suggested that the condition is linked to mutations of the cathepsin C gene. Two cases of Papillon-Lefevre syndrome in the same family, having all of the characteristic features, are presented. An 11-year-old girl and a 9-year-old boy presented with the complaints of loose teeth. 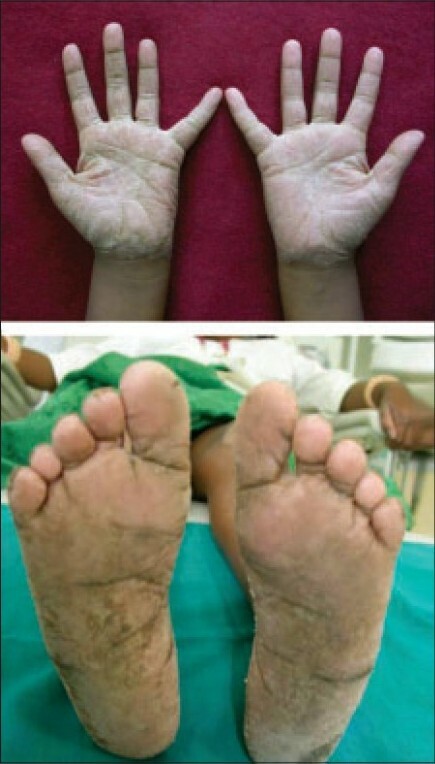 Both expressed hyperkeratosis of palms, soles, and knees. Severe generalized periodontal destruction, with mobility of teeth, was evident on intraoral examination; orthopantomograph examination showed severe generalized loss of alveolar bone in both the patients. Autism is a developmental disorder characterized by severe deficits in social interaction and communication. A wide spectrum of medical and behavioral symptoms is exhibited by children with autism, which makes routine dental care very difficult in them. Bruxism or forceful grinding of teeth is one of the sleep problems commonly observed in children with autism. Our patient, a 4-year-old male child with autism, presented with complaints of pain and sensitivity of the teeth. There was history of excessive grinding and clenching of teeth. 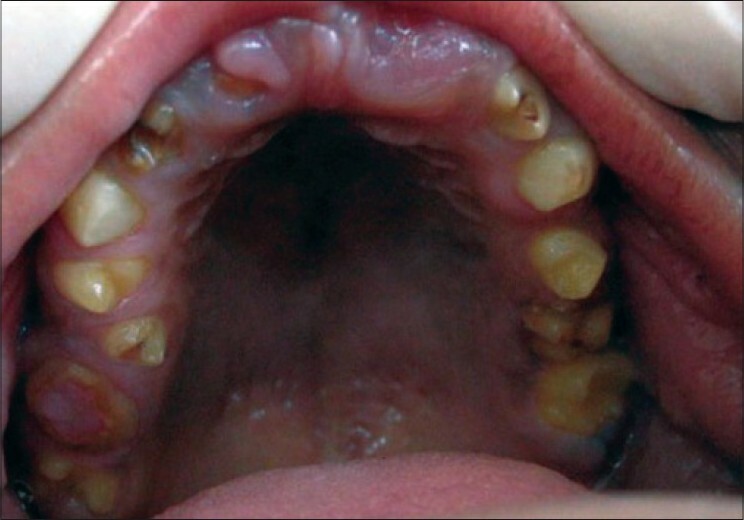 Limited oral examination revealed severe attrition of all primary teeth. Treatment was planned under general anesthesia because of his poor cognitive abilities. Full-mouth rehabilitation, including placement of stainless steel crowns for all primary molars, was done. Following treatment there was a significant decrease in the grinding habit over the next 2 months. Although the communication and behavioral problems in children with autism pose challenges for the dentist, treatment with proper planning and a lot of patience can definitely make a difference. Dentinogenesis imperfecta is an autosomal dominant disorder of tooth development characterized by the presence of opalescent dentin, resulting in a dusky blue to brownish discoloration of the teeth. This condition is genetically and clinically heterogeneous; it may affect only the teeth or it may be associated with the osteogenesis imperfecta. 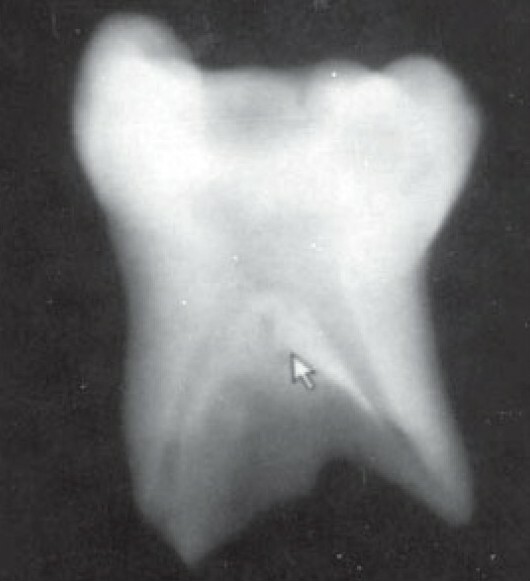 Dentinogenesis imperfecta has been subdivided into three types: type I is associated with osteogenesis imperfecta; in type II there is no associated osteogenesis imperfecta; and when the condition is associated with the Brandywine triracial isolate and large pulp chambers it is classified as type III. This report describes a 16-year-old female patient who showed the characteristic dental features of dentinogenesis imperfecta type II. 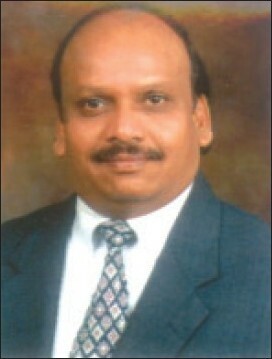 The etiology and prevalence of the disorder, and a comprehensive treatment plan, will be briefly reviewed. Clefts of the lip and palate are a common craniofacial anomaly, The etiology is thought to be multifactorial, with both genetic and environmental factors playing a role. Because of the frequent manifestation of cleft lip and palate in association with some syndromes, it is essential that a detailed examination of these patients be carried out. This facilitates early formulation of preventive and treatment advice and aids in overcoming gross deformities in the early stages of development. In this paper, we review three such patients who presented with cleft lip and palate in association with a syndrome.